Years ago, during a difficult spell in life, a dear friend gave me this verse, framed to display and remember. Just like the change of seasons, I saw that we have seasons in our lives. 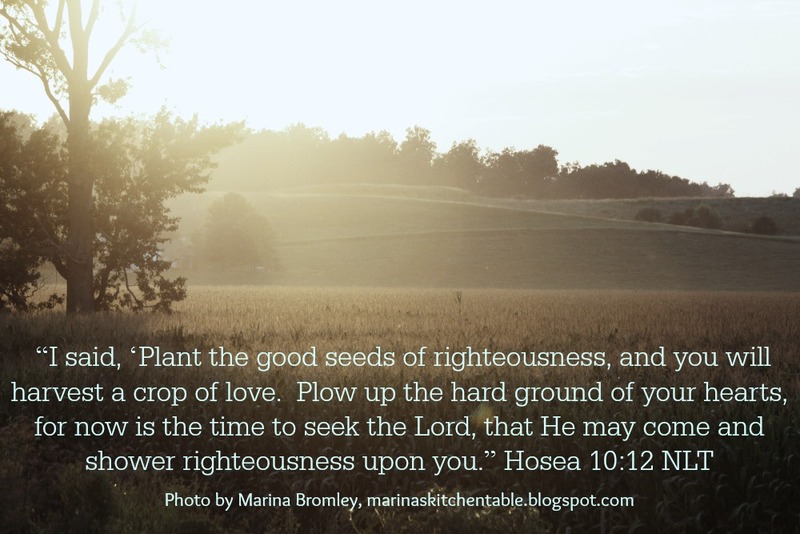 Just like we care for the ground, tend to our trees, or plant new seeds, we need to tend to our hearts and minds to make our walk with God, and our lives, more fruitful. As a new homeowner, I remember learning how important it was for a tree to lose it’s leaves in the fall; so all it’s energy could go into growing good roots, making it healthier in the springtime. Sometimes life is like that for us too; we love the new blossoms of spring, the shade and colors of summer, and even the change of color in the leaves in fall, but when the trees are bare - the last of the vibrant oranges and reds and yellows turn to brown and fall to the ground - our own hearts seem to want to turn and hibernate too. Yet it’s during THIS season that God wants to do some of the deepest work in us. Perhaps we can allow ourselves to acknowledge God’s part in our lives during our seasons of thanksgiving, and we can let it be the start of getting our spiritual roots to run deep and grow strong, carrying us through the droughts of life, or the hardships of winter. I’m reminded that we have work He has asked us to do, before God can do His work in us, or through us. Just like we may divide our crowded bulbs in the fall, or turn over the soil in the fields after harvest, we should allow God to break up the “hard ground of our hearts” during this season of regeneration. I think that we, just like the plants in life, need to have our season of root growth. I love this from Psalm 1, “But they delight in the law of the Lord, meditating on it day and night. They are like trees planted along the riverbank, bearing fruit each season.Their leaves never wither, and they prosper in all they do.” The trees bear fruit in each season, but only because they are well cared for by meditating on His law day and night! What a wonderful vision for those of us that forget to nurture our roots in His Word. All throughout the Bible, the authors used seeds, growing, fruit, soil, crops, and many other farming terms, to describe our life with God, our journey with Jesus. So in this season, let’s break out our Bibles, dust them off if we need to, and find a quiet place to nurture our spirits by meditating on God’s Word. Perhaps with enough tending to our roots, we can bear even more spiritual fruit! This post was first published in the November 2011 edition of "Connections Magazine of SW Missouri." You can read the original post online here.